“Would you like to select your lobster?” our waiter asked. “No,” I responded. He recoiled, slightly. “I do not want develop a personal relationship my lobster. I just want to eat him. Please pick me out one of the smallest ones you have,” I begged, mindful of our budget ($50/day for the two of us combined for everything), even for a belated birthday dinner (click here to read about my "Raincheck Birthday"). 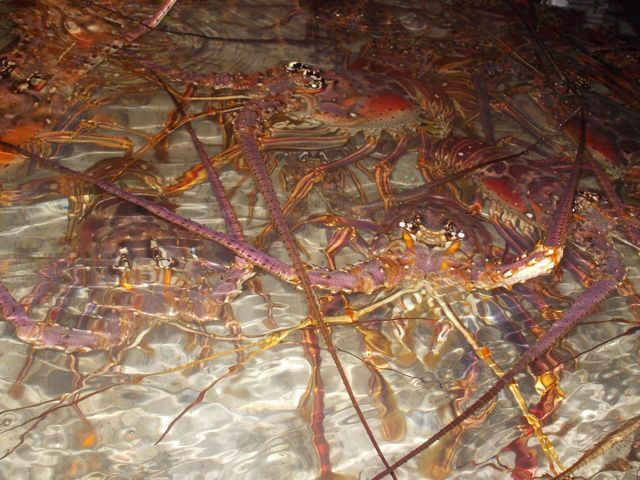 The lobster cost $19.95 a pound. He found me a 1 ½ pound lobster, a perfect match for my appetite and a rare budget-busting splurge. Sure, Portlandia is one of favorite spoofs. The restaurant episode revealing the intimate menu resume addendum of “Henry the organic chicken” is one of my favorites (click here for it -- note -- may not be viewable outside the US). Instead, I heartily embrace the “I’m usually a vegetarian, but…” Portland localvore’s (click here if you’re not sure what a localvore is) philosophy. She named her rabbit and future dinner “Pro” for protein. If I had three chickens, I would name them, “scrambled,” “over easy,” and “sunny side up,” even though I’ve been a vegetarian from time to time in my life, and may be again. Back to my celebratory lobster dinner…. Yes, lobster is a hands-on kind of meal. But the only intimacy I wanted with my lobster is savoring its sweet taste on its way down my hatch. I don’t take that lightly. 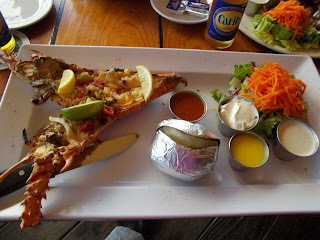 While I don’t know if my lobster lived a full and happy life, I do know it was a decade or more since I last ate lobster, and this would be my first Caribbean lobster. Unless I learn to catch, prep and cook these cranky crustaceans myself, it might be that long again before I indulge again, given my primarily haute ramen budget. 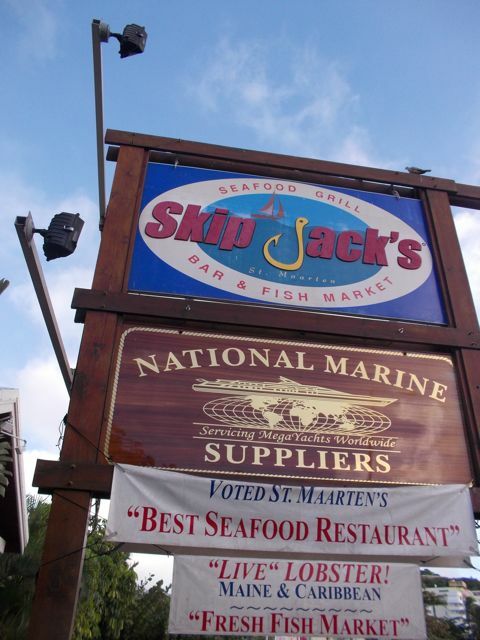 Our celebration site was SkipJacks, which proclaimed it was “Voted St. Maarten’s Best Seafood Restaurant.” Several folks we talked to in St. Maarten declared SkipJack’s was their favorite restaurant. Maybe my hopes were too high, especially since I’d rather we ate at one of the picnic tables in Grande Case (St. Martin, the French side of the island), at a sidewalk beach BBQ cafe. Timing just didn’t work out for that. Timing I suspect was the issue at SkipJack’s, too. We arrived at 4:30, a little before the dinner crowd. After several minutes of trying to catch an employee’s attention, our waiter looked almost reluctant to seat us. I surmise we further sealed our fate by overlooking the fancy priced-cocktails and respecting our beer budget, literally. Worse, both we and our waiter knew he’d be getting a minimum of a 15% tip (we’d heard the voluntary norm on the island is 10%) regardless of the quality of his service; the menu noted it was built into the bill. Our waiter never cracked a smile, nor did the rest of his demeanor give us the impression he was happy with his job, or us. texture and loved the BBQ style preparation. That said, my BBQ & Creole-sauced lobster was pretty darned delish. It tasted sweeter than any other lobster I’d eaten. 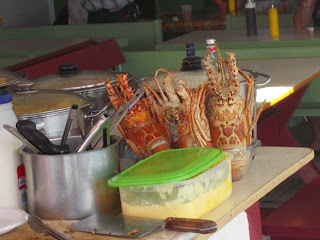 Its meat was flakier, more crab-like than the dense almost rubbery lobster I’ve eaten before. I love crab (click here to read about my cooking adventure with crab), also a rare treat. We topped it with a relatively small, humble slice of key lime pie. We rarely order dessert, It set us back $8 (plus tip), but for Wayne, less enthralled with his BBQ rib dinner, it was the best part of the meal. It was bursting with flavor. 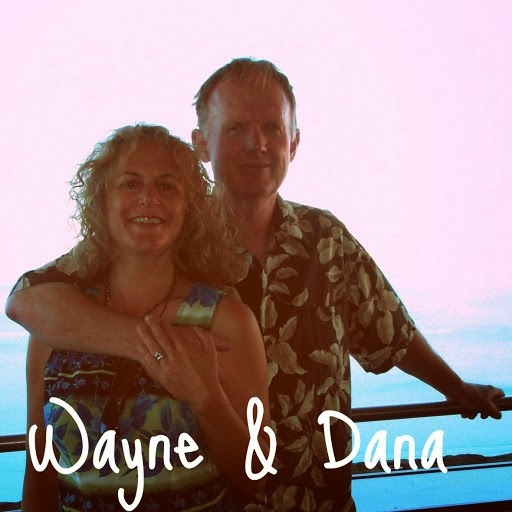 Our $81 and change bill – mandatory minimum 15% tip included -- was painful for us. Worse, our credit card company billed us $103! 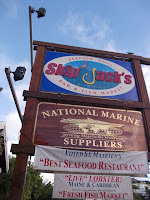 We revisted SkipJack’s who verified by showing us their daily bank tally their charge to us was “only” $81. As mysteriously as it appeared, it did get corrected. 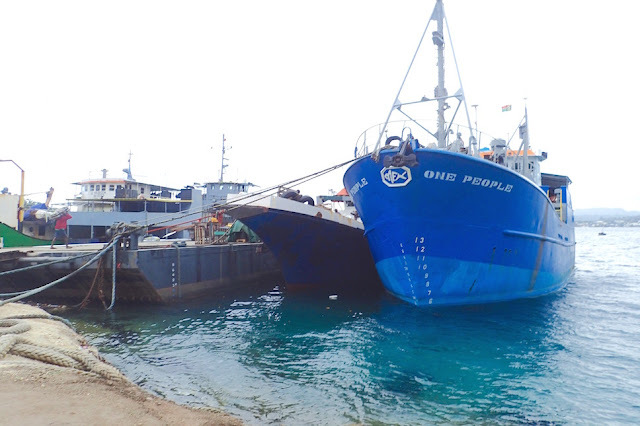 We all agreed it was a bank or credit card error, not a SkipJack overcharge. We wish the gal who helped us check the bill had been our waitress when we ate there. I believe the meal would’ve been a much better experience. But I do need to find a cruiser-viable key lime recipe as good as SkipJack’s. Any suggestions?